I somehow managed not to take a photo of our pleasant and skilled teacher. I did take photos of her mittens, but as she doesn’t want them to be published I can’t show them. 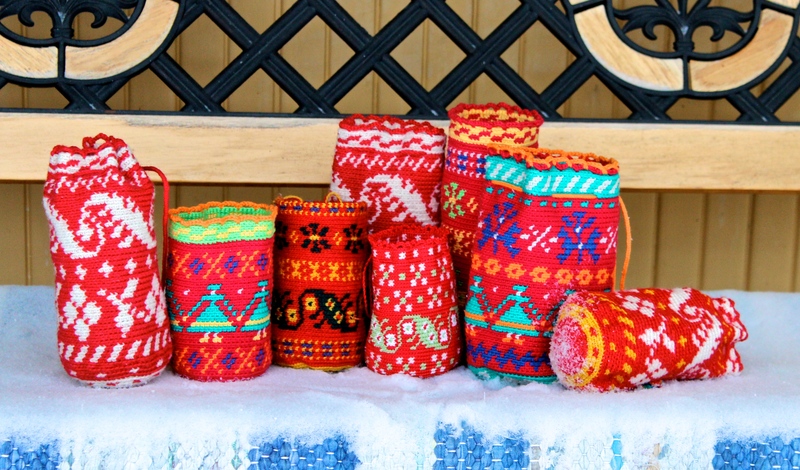 Karin has made very beautiful knitted mittens and sleeves, as you can see from the few photos on her site. I wanted to show the wrong side, because it’s different from how you usually knit stranded knitting and fair isle. Every stitch is bound or twisted, and you throw the yarns. 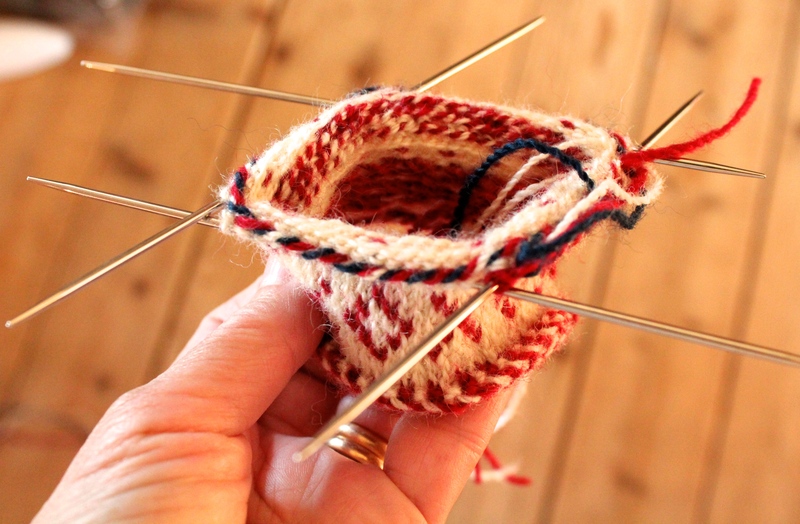 The continental way of knitting doesn’t work in two-end knitting. I’m pleased with the swatch as it looks now compared to the one I first started knitting. You have to knit firm, otherwise the patterns won’t look nice. In this exercise you learn how many threads you need to use in each pattern, and how they are bound and twisted. In two-end knitting you use Z-twist yarns, so now I have a new challenge in my spinning. For some reason I find it much more difficult to spin S than Z. I think it has to do with very small changes in how you use your muscles in your drafting hand. So, the way to cope with that is to spin more S-twist singles to train your muscles! We use Z-twisted yarns because S-twisted tend to loose rather much twist in this technique. This is of course, as so often when it comes to textiles, a matter of “it depends”. 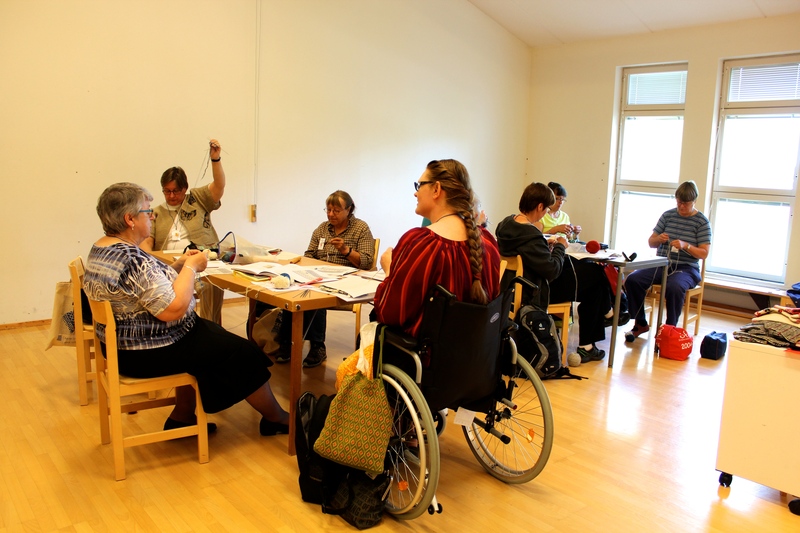 Your personal way of knitting, how you keep your yarns in your hands, how you pick the stitches or throw your yarns, whether you’re right handed or left handed, all this affect the yarns and how your knitting looks. So, test different ways and decide for yourself how you want to do it. We also could to listen to some very interesting talks during the five days, and we visited several museums and saw some of the beautiful textiles from my region. I met new people, and some that I’ve met earlier in Scotland, Shetland, Finland, Sweden. It was a wonderful five days! Wonderful 5 days is right! 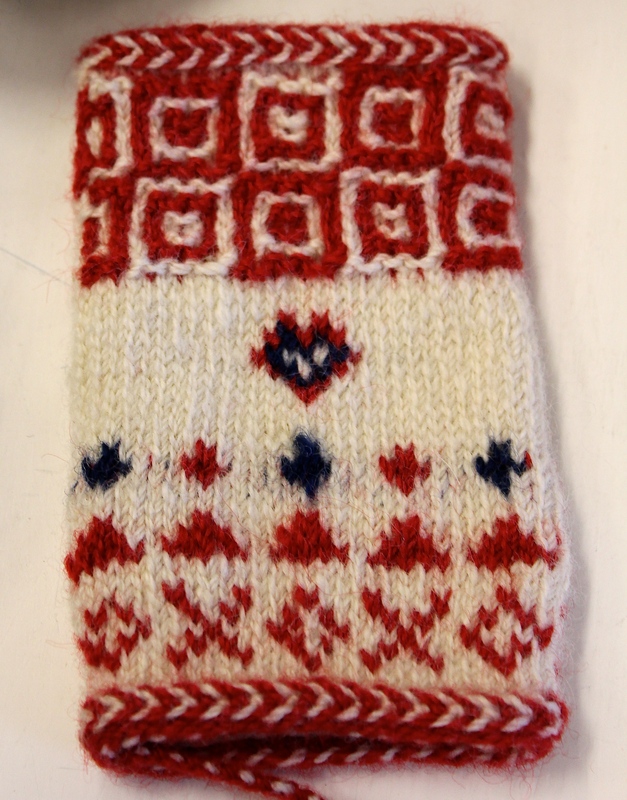 I love Karin’s mitten that has the squares on the back in black and white. I have some of the yarn used for twined knitting and the book……Please don’t ask me what I have accomplished 😦 A friend brought back some of the yarn from Sweden and it is lovely. Thanks for the post.